Inking It Up With Cathy: What People Can Do with Punches! What People Can Do with Punches! I am always amazed at what stampers do with their punches! Last July, Mom and I went to Stampin' Up! 's annual convention where we swapped our creations with the creations of thousands of other people. Okay, we didn't swap thousands but between the two of us we had well over 100 swaps. One of the ones that Mom was received was an adorable geisha girl made completely from punches. I love getting inspiration from other people's creations but always like to put my own twist on things. 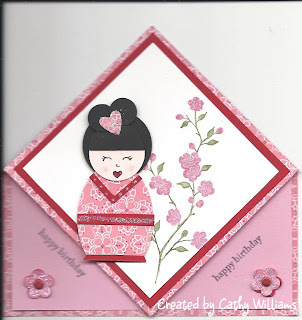 Here's my geisha girl card. If you'd like instructions on how to make the fold card or the geisha girl, just email me and I will provide you with the instructions. I love sharing what I love!!! Love your Geisha Girl, could you send the instructions? Cathy, I stumbled across your awesome blog whilst checking out some of the happenings from the Leadership 2011 I've been following. Would love some instructions for your Geisha Girl punch art and card. Pretty puhleeze? Have a girlfriend this would be absolutely perfect for. Thank you.